Metal office chairs are valued for their versatility and ability to withstand long-term wear and tear while requiring only minimal maintenance or cleaning. 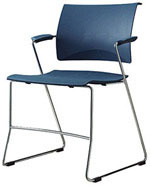 Simple, streamlined chairs may be stacked for convenient storage and used for large group meetings or overflow needs. More intricate metal chairs often have a contemporary, futuristic flair that may include multiple ergonomic features, including adjustable seat and back height, lumbar support, or even luxurious leather padding suitable for a top executive. Since ROF carries a variety of office furnishings, finding the chairs you want is simple. Whether you’re interested in armless chairs that easily fit next to each other during group meetings, or chairs offering lumbar support, ROF can help you find the chair design that’s right for your offi ce.